Social media is booming in the business industry with 85% of companies using various social platforms for top-funnel purposes such as exposure and product awareness. Furthermore, as many as 69% of organizations use social media for traffic and lead generation, and 65% of businesses use it for market research and insights. There’s no denying that social media can be an extremely powerful tool when harnessed correctly. However, unfortunately, we are finding that many businesses are all too quick to jump into the social sphere without first having the proper training, knowledge and insights necessary to make it their efforts worthwhile. It’s imperative to understand that social media is only effective when strategies are both analyzed and measured for performance. Otherwise, businesses run the risk of just playing a guessing game – blindly throwing out content on various platforms hoping to gain some vague concept on the returns of their efforts. 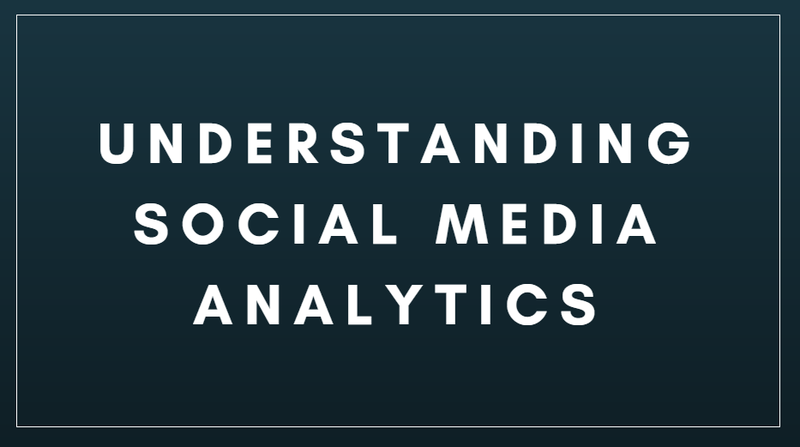 This is why understanding social media analytics is such a vital concept. The insights received from these valuable data sets help give your strategies and tactics focus and purpose. The truth of the matter however is that understanding analytics takes time, effort and research – and every social site has a different set of engagement metrics available to interpret specific to their platform. The good news is that many of these platform-specific metrics have commonalities and understanding these concepts with holistic terms can be very enlightening. So, if you’re interested in social media analytics and understanding how they can help you achieve your strategic goals, then look no further than these next few lines. LoginRadius does a great job at describing three main ways in which understanding and monitoring social media analytics can help businesses achieve their strategic goals more effectively and efficiently. Diagnostics. Understanding analytics gives you the ability to assess your content performance and adjust both your strategies and timing in order to achieve the best results possible. Prioritization. With a thorough understanding of analytics, we are able to determine “which content, social platforms, users, and other factors get priority” based on the insights we receive from various data sets. The insights achieved from analytics is the very information used to craft well-developed strategies and tactics. Evaluation. With a thorough understanding of analytics we’re able to determine the success of our efforts, identify methods for calculating our ROI and thus, figure out the “overall value” to our marketing strategy. Analytics can help companies conduct market research by providing them with valuable and precise data and insights into their audience’s demographics, psychographics and behaviors. They can help companies manage their online reputation by monitoring brand mentions and engagement and they can help businesses optimize their performance on social media initiatives. Many businesses also find success in utilizing analytics to help “identify key touch points” along the customer journey. With these valuable insights, companies are able to interact with consumers at every step of the way with features such as social listening. 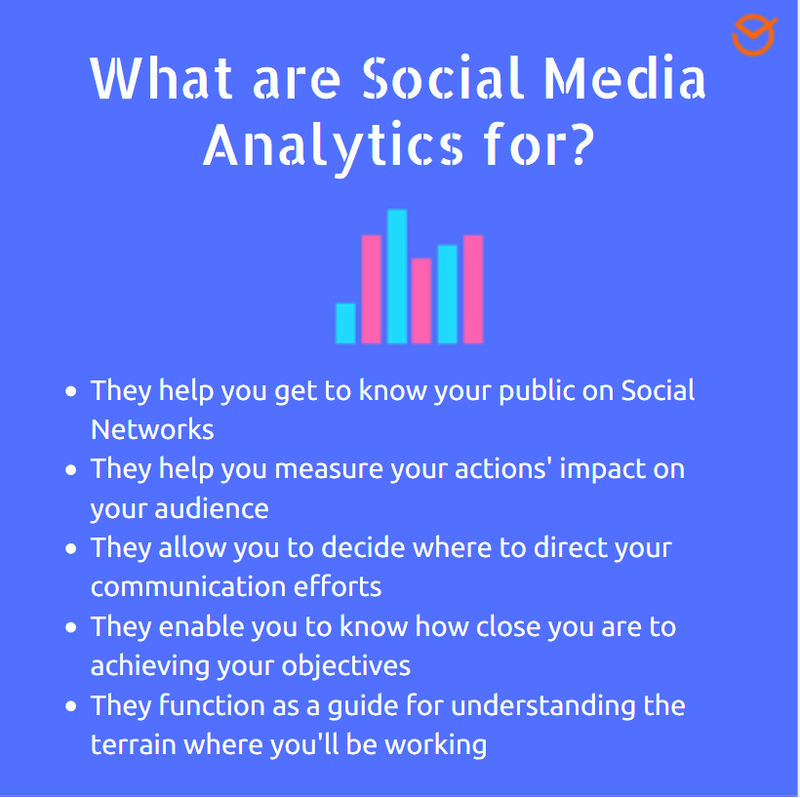 These are just a few of the main ways in which businesses are harnessing their knowledge of social media analytics and monitoring to further their endeavors, but the possibilities are quite endless. So now that you’re familiar with the specifics regarding the various ways analytics can benefit your business, you’re going to want to get a general grasp on common social media metrics available for measurement and interpretation. Generally speaking, getting a grasp on the most common metrics used in social media is recommended, especially for those who are just starting out with analytics. This is because there are hundreds of metrics available for measuring and dozens of social platforms that have their own platform-specific metrics and ways of interpreting them to consider. As a result, it can be quite easy to get into a mind-numbing state of sensory overload and “analysis paralysis”. The good news is that many of these platform-specific metrics share common themes and once these commonalities are identified, it can really help to clarify your understanding of various metrics across all social spheres. This theory of engagement was initially one that was proposed by Avinash Kaushik in 2011. His theory became so popular that it led to BufferApp putting it to use in their social media monitoring efforts a few years later. Applause Rate measures the way in which users support a post on various networks. This is the lowest level of the engagement rates because it takes the least amount of effort and details actions such as likes (on Facebook, Instagram, LinkedIn and YouTube for example) and retweets (on Twitter). Conversation Rate measures the number of times your social media post is engaged with on a conversational level. For example, if your platform of choice is Instagram, Facebook, LinkedIn or Google , then this would measure the number of comments per post you receive. On Twitter, the terminology is replies. Conversations require more effort on the user’s end and as a result, you are able to use this metric to identify which tactics, content formats or subject matters were valuable enough to compel a user to spark up a conversation. Amplification Rate measures the number of shares or retweets that a social post has received. These are the gold standard in engagement metrics because they show that your content was so compelling that your audience was urged to literally promote it on their own free will. Economic Value is described as the sum of short and long-term revenue and cost savings. A small percentage of individuals may be compelled to visit your website and do business with you, purchase a product or service or sign up for an email newsletter. These macro and micro conversions give you the ability to calculate the economic value of your social media content. This can be calculated mathematically with an in-depth analytics tool such as Google Analytics, WebTrends or Omniture. For more information on how to calculate economic values of your content, check out Kaushik’s insanely insightful post on the matter. While engagement rates primarily deal with the performance of your content, other vital metrics include those more focused on your social media presence on a holistic level. Reach deals with the size of your audience and can be viewed at on both a macro level as well as a post level. This typically refers to the number of people who have liked and/or subscribed to your page and as a result, are going to be in the sphere of content exposure from you. Audience Growth Rate measures how your audience has grown over a specific period of time (i.e. week, month, year). Impressions refer to the number of individuals who were exposed to your content in their social media feeds. Engagement Rate is a valuable metric that can be calculated when you have data on both impressions and engagement and gives you an overall sense of how often people are interacting with your content. So, you end up with a 7% engagement rate on that specific post – which ain’t all too shabby given the fact that Facebook engagement rates of anything above 1% are considered ideal. However, many times native platform analytics simply just don’t provide the level of insight into social media metrics that many companies are searching for. This is where analytics tools come into the picture. Most platforms now have their own native analytics software, however additional more robust options are always available for free and at a price (some more steep than others). Popular social media analytics tools include heavy hitters such AgoraPulse, BuzzSumo, Hootsuite and SproutSocial, to name a few. It’s important to understand that if you have a need for it — chances are there’s already a tool out there measuring it. The options are practically limitless and you’ll more than likely have to experiment with several tools before you’re able to figure out which ones serve you best. A streamlined social media monitoring and management process by offering users a single dashboard view of all of their profiles, the ability to schedule posts and the option to monitor and engage in one single location. Access to precise data and insights. Users are able to gain access to more user-friendly forms of data for analysis such as charts and reports that cover every aspect of social media management as opposed to just one or a couple. Competitor analysis and comparison. These features can be used to curate content ideas, mine data and gain greater insight into the strategies of your competitors and where they succeed and fall short so that you’re able to get a leg up on the competition. Feedback Analysis. Features such as this give you valuable insight into your audience so that you’re able to gain a greater understanding of what makes them tick and develop more meaningful relationships with them. Overall, analytics tools are absolutely indispensable to ensuring you make the most of your social media strategies. Businesses now more than ever are seeing the amazing benefits that a well-developed understanding of social media analytics can have on their marketing efforts. This is because metrics, which are often platform-specific, can give businesses powerful insights into their audience, brand identity, content performance and competitors. Without a thorough analysis and understanding of this data efforts are often directionless and lack concentration and effectiveness. 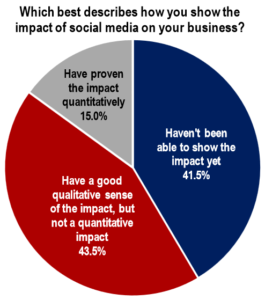 The truth of the matter is that if you’re looking to genuinely be able to quantify the impact that social media has on both your marketing efforts and your bottom line, you’re going to have to get savvy with analytics. So, use this post as a general guide to give you a sense of direction when it comes to tackling platform-specific analytics. It’s our hope that with this valuable information you’re able to gain greater insight into your brand, audience, performance and competition for improved decision making and long-term sustainability.